If you are going to have an outpatient visit or an inpatient stay with us, we want you to know that our team is here to help you in any way we can. Never hesitate to ask any Reid team member for help while you are here. You will also find numerous services and resources to help during your stay, both as a patient and visitor. Are you having an outpatient procedure? We have comfortable accommodations and waiting areas for your family members, including Room Service food ordering, easy access to our Golay Chapel should you want a place for prayer or meditation, our nearby Espresso bar and Cafe at Twelve Hundred, and outside gardens. Are you being admitted? You will find a handy patient and visitor guide in your room that includes extensive information to help you and your family while you are here. The guide includes a campus map, details about services available for you and your family members, information to help prepare for your discharge from the hospital, special forms that you might need and more. You will also find a Room Service menu from which your family members can also order for food delivery. Complimentary valet parking service is available from 7 a.m. to 5 p.m. Monday through Friday at the main entrance. This service aims to assist patients arriving for services and their visitors. 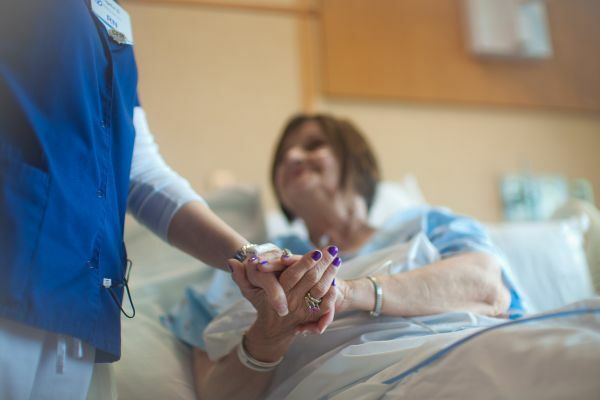 To facilitate the healing process, we realize the importance of visitors to our patients. Family and significant others are encouraged to visit when it is convenient for both visitor and patient. If you want visitors limited, please inform your nurse. Please note: from 9 p.m. to 5 a.m., visitors should enter through the Emergency Department. The visitor entry point is in front of Human Resources with a Security officer operating that post. Visitors between 9 p.m. and 5 a.m. will be required to have a photo Identification to enter our facility. A Security officer will create a visitor pass that should be displayed on your clothing so it is clearly visible to Reid employees. In addition to the traditional selection of cards, magazines, newspapers, books and flowers, the Ginkgo Boutique is famous for a wide selection of unique and hard to find gifts. The Boutique also offers soft drinks and water, free gift-wrapping station and a helium tank for balloons. The Café at Twelve Hundred is more like a restaurant and food court than traditional cafeteria—complete with a chef’s table, large salad bar, and lots of self-serve entrees, sandwiches and sides. The Café also offers brick-oven specialty pizzas and grill items made to order. Guest meals can also be delivered to patient rooms using Room Service if this is more convenient. You should find the menu in the room. We also have the Reid Espresso Bar, proudly serving Starbucks® coffee and a variety of teas, cold drinks and delicious baked goods, the Espresso Bar is a favorite stop for both visitors and employees. It is on the main concourse and selections are available after hours in the cafe’. Free wireless guest network throughout our main campus. Public computer stations near our Espresso Bar on the main campus. Massage therapy available to both patients and visitors. Patients should ask their caregivers; family members can purchase coupons in the Ginkgo Boutique on the main concourse.